Revised Kindle eBooks are currently available on Amazon, with 30% more content and new guest articles by bestselling authors. Ever wish you could peer into the brain of a published author and learn what tips he’s absorbed over the years? How did he get where he is? How many times did he submit manuscripts before he sold his books? Or maybe you’d like to delve into the psychology of writing, and learn what motivates him. How does he balance life with writing? How can regular tweeting help? 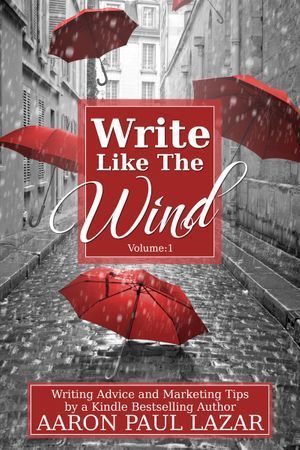 In volume 1 of Write Like the Wind, Lazar offers advice on “forbidden words,” “hooking your reader,” and “writing like you talk.” These hard skills are complemented by recommendations for promotion, such as “writing reviews to build your platform” and step-by-step instructions on how to prepare for a radio show. Join award-winning mystery author Aaron Paul Lazar as he shares the cream of the crop from seven years of writing blogs in this fresh and unique offering of advice for fellow scribes. "Loved it! A true gift for writers." "Write Like the Wind Volume Two is a beautifully crafted work that will delight anyone who seeks to understand not just the essence of writing, but also the writer's heart. In this wonderful and far-ranging collection, Aaron Lazar shares his experience, opinions and insights with exceptional candor and generosity. From exploring the fundamentals of creating and telling stories to dissecting book marketing and publishing trends, Write Like the Wind is an eye-opening, authentic account of the challenges and opportunities that comprise the writer's journey. Soothing, crisp and reflective, the superb narration seems to flow from the writer's very soul, embedding the listener into writing's intricate world, inviting all of us to experience the writer's life with faith, courage, enthusiasm, passion and joy. I loved this fun, wise, inspiring and thought-provoking audible, a true gift for writers and aspiring writers everywhere." This writing guide is the first in three volumes of a compilation of blog pieces I’ve written over the past ten years for fiction writers of all levels. Included are writing tips, promotional ideas, stories of my own writing life, and topics dealing with the emotions a lonely writer can experience. I’ve recently updated and expanded the series with new articles, up-to-date links, and guest essays by a number of acclaimed authors, including an introduction by Mr. Michael Prescott, New York Times and USA Today bestselling author. I hope you’ll check out the amazing assortment of novels I’ve included as links after each guest author’s piece. Whenever I stumble across something in the writing process, whether it is new-to-me technical skills or promotional methods, I want to share them with my network of writing pals. I’m driven to help new writers just as my mentors helped me in the beginning of my career. Sort of like paying it forward, you know? I guess it’s a strange concept, but I have this vision of unleashing swirling gusts of words, just like the wind that rattles leaves in trees and blows hats along the sidewalk. Don’t stop to analyze, don’t hesitate, don’t edit yourself to death. There’s plenty of time for that later (and then you can “Edit Like an Architect” like my friend Natalie Neal Whitefield says.) Just let it all out in one big gushing explosion of words, and keep going until you reach the last chapter. Thanks for ordering this guide. I’d love to hear from you, so if you’d like to say hello, feel free to drop me a line at author@lazarbooks.com or stop by my website at http://www.lazarbooks.com. There are two more volumes in this series to date. I’ve listed the links and contents at the end of this book.